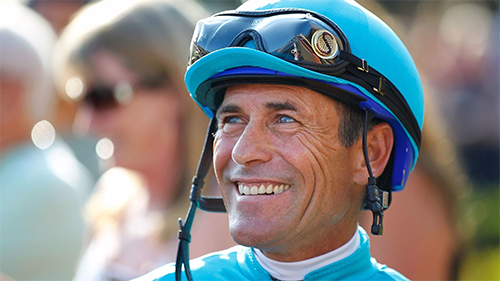 Jockey Gary Stevens has had the ride on some of the greatest horses in racing history. On Tuesday, November 20th, he announced that he would retire from racing. The announcement came after an accident in the post parade at Del Mar and after his orthopedist confirmed a spinal injury that could become more serious, should he fall again. "There won't be any comeback from this one," Stevens stated in reference to his two previous retirement comebacks. He described the accident has a whiplash effect, which caused his right arm to go numb. Stevens retires with an impeccable career. He nearly won the Triple Crown on Silver Charm in 1997, but nonetheless has won each leg of the Triple Crown three times each. He's won 11 Breeders' Cup races on champions such as Da Hoss, War Chant, Beholder and Mucho Macho Man. He won the Kentucky Oaks twice and the Santa Anita Derby nine times. Stevens started his riding career in 1979 at Les Bois Park in Idaho. His success in Idaho and Washington in the 80s took him to Southern California for the bulk of his career. He also rode in races in Kentucky, Arkansas, Hong Kong, France, Ireland, Dubai, Japan and Great Britain at the Royal Ascot. Stevens has retired twice before. His first retirement was in 1999 due to knee problems but returned to riding the next year. He retired again in 2005 and worked as an analyst for NBC. He returned again in 2013 when he won the Preakness on Oxbow and the Breeders' Cup Distaf on Beholder. He also one the Classic that year on Mucho Macho Man. He played the jockey George Woolf in the movie "Seabiscuit" and the HBO television series "Luck." He retires this time with 5,187 wins and $257,213.87 in lifetime earnings.